It's one of those magical family nights full of giggles, laughters, wonders and awe. Our master room reeks of indescribable joy as our two children were playing happily with their toy kitchen. It's already past 9pm but they get extended play time because our girl is on a week-long school holidays whilst our hyperactive toddler haven't got enough from playing outdoors. There is nothing really outstanding with the toy kitchen we bought them Santa Claus gave them last Christmas. It is made of plastic and it is one of the cheapest you can find in town. In fact, it is one of the boy's least favourite amongst his toys. It is the last thing he remembers playing with after he gets bored with his wheeled and winged little friends (read: cars, trucks, trains, aeroplanes). Last night however was a totally different story. The toy kitchen instantaneously became the apple of his little charming eyes. Why is that so? Because his big sister played with him enthusiastically, giving the strictest instructions like a junior master chef. "Don't touch the pot, it's hot! ", she warned his little curious brother. The little brother then purposely opened the pot cover to piss off his big sister and then giggled like he was just told the funniest thing on earth. "Okay never mind, just add some water", the big sister instructed. The little boy lifted the kettle with imaginary water and poured some in the pot with corn on the cob inside, still giggling. The hubby and I were watching the kids in awe as our hearts were bursting with priceless joy. The kids went on playing. "Okay, time to wash your hands. Dinner is ready", the big sister declared. This time around, his little brother obediently followed what he was told to do so. He turned the toy kitchen faucet on and washed his hands with imaginary water while giggling non-stop. The big sister then laid the plates, spoons and forks, along with their cooked food on the master bed. Whilst the kids pretended eating happily, the hubby stood up and decided to join the fun. He took the kettle and poured some real water in it, much to the little boy's delight. He abandoned his spoon and fork and asked the hubby to give him the kettle. He poured the water to the pot and was so pleased that daddy added more fun to their playtime. "Dada, more water please", he pleaded as he finished pouring all the water from the kettle to the pot. This time around, I stood up and help the little boy pour back the water from the pot to the kettle so that they will not waste water. He's having so much fun playing with his big sister that I couldn't bear to call it a night just yet even though I wish to retire to bed already. The kids went on pouring water from the kettle to the pot, from the pot to the cup, from the cup to the kettle and repeated the cycle countless times. Cook. Wash hands. Eat. Cook. Wash hands. Eat. The giggles and laughters from their extended playtime drowned the terrible two tantrum that followed later on when we declared it's time to sleep. In life, all we need is to learn to treasure and remember the good times so that we could look pass the terrible times and live with a grateful and happy heart. The kids must really love playing with the kitchen set. I'm sure my kids would love it if we do have a set at home. oh kids, they will never feel any tired even though it's pretty obvious to see on their faces, as long as they enjoyed they will still have the energy to play more than we think... i'm sure the tantrums comes later on when both were already tired enough and has to get rest. I could almost imagine the laughter and cute giggles that were filling the room Che. This reminds me of my favorite game when I was a kid, bahay-bahayan. I also love watching my kids play, they're my stress reliever. Seeing them smile carelessly is priceless. my daughter's laughter is my stress reliever..so i know the feeling of being delighted to hear those giggle + seeing your hub and kids having fun is a treasure. 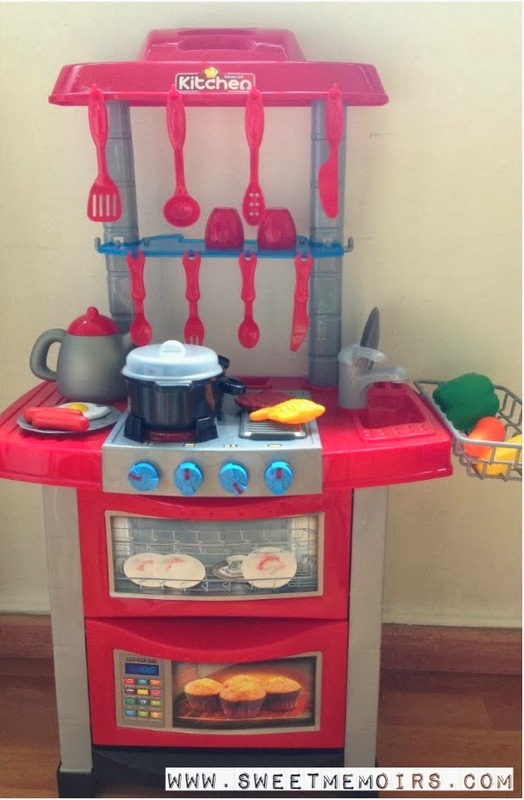 that's a nice kitchen set...I love seeing kids playing pretend in the kitchen...I miss my childhood days! I bet your chefs had a blast "cooking" for you guys. When my daughter was little she spent a lot of times from her kitchen set but now, she prefers the real one. Awwww! This post had me reminiscing! I may not have owned a beautiful kitchen toy like that but my version of "bahay-bahayan" with neighbors and cousins as my playmates can never be outclassed. Hahaha! It's always priceless to have shared these fun moments with family. I miss laughing out so loud with my own family back home. Na-homesick tuloy! LOL!